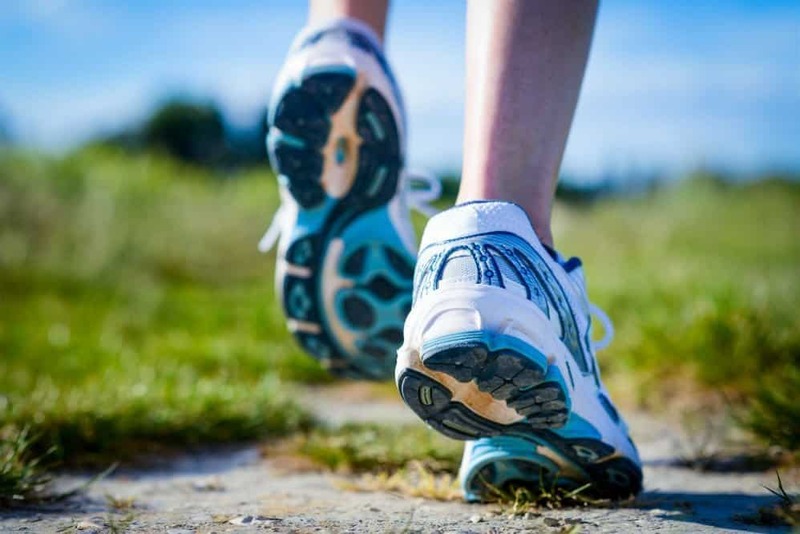 Home » Articles » How Much Do Running Shoes Weigh? What self-respecting runner doesn’t get excited when buying a new pair of running shoes? With all of the choices, it can seem like a huge decision: brand, model, style, color, etc. If you’re really concerned about the ins and outs of the shoes, you might even check the weight to see if you can save half an ounce here or there. Is that half-ounce or two really worth worrying about? More to the point, is that half-ounce or two-ounce difference worth paying for? It certainly can be. While these weight differences don’t seem like much when you are standing in a running store holding a shoe in your hand and thinking about saving $20, keep in mind that, even over the course of a 5k, you might be taking close to 5,000 steps. At one extra ounce per step, you will have lifted close to 275 pounds more shoe weight in the course of your short race than the person who sprang for the lighter shoes. That weight adds up quickly, and can compromise your performance and fatigue your legs. The obvious follow-up question is: are you the type of runner for whom shaving seconds off a time is a critical matter? Weight, performance, comfort, and price are all interrelated. Let’s take a look at how to find your own balance to this equation. Running shoes are a many-varied thing. They range from track spikes and racing flats up to ultra-cushioned, plush trail shoes made for mountainous ultra-marathons. In general, though, they are ergonomically designed to partially handle the shock of your body weight every time your foot strikes the ground. Their first function is to propel you forward, as fast as reasonably possible. They can also provide a cushion to both your heel and your forefoot, and provide traction on a track, road, or mountain trail. They can also give protection to your feet, legs, and body against the repeated stress from foot landings. Running shoes are made with built-in features that allow you to run, walk, and train comfortably while lessening the chance of injury due to over-usage. Some of the advantages of running shoes include flexibility, stability, breathability, traction, and cushioning. What Are the Cushion Levels? In most cases, the cushion level of running shoes determines their weight. Let’s take a look at the different amounts of cushioning, and determine what’s best for you. This is the top-of-the-line technology that offers optimum cushion. It is perfect for daily high-mileage running routines, as it provides maximum protection for runners. Running shoes under this category are built for long races such as half and full marathons. They are also ideal for runners with larger frames or builds. This is your go-to running shoes for high-level performances. They are recommended for long and short daily racing and running. Shoes that fall under this category are versatile for high and better mileage. This features a perfect balance of light weight, moderate cushion, and flexibility. They allows you to pick up your pace with a fast and energetic feel that’s perfect for daily, tempo, and even race running. Running shoes under this category represent the exact midpoint between cushioning and a natural feel, and are ideal for expert runners or those looking for a good-tempo shoe. This includes incredibly light and extremely flexible shoes. They features a subtle touch of cushioning and a minimal feel, and they strengthen the feet. Since less-cushioned shoes engage the foot more in absorbing the shock of running, they also push you toward better running form rather than dampening the effects of poor form. Highly competitive racers often use shoes under this category, since they allow a better feel and connection to the road. This is the lightest and probably the most flexible design that offers minimal protection to the feet. Using these running shoes will make you feel almost barefoot, yet still protected. Running shoes under this category will help strengthen your feet while walking, running, or during training. An average, mid-level running shoe for men weighs a bit under 270 grams, or 9.5 ounces. Women’s shoes are, on average, smaller and therefore lighter. But there is lots of variance. The shoes Eliud Kipchoge wore to run his 2:00:25 marathon in 2017 weigh just 195 grams. The shoes Francois d’Haene wore to set the course record at the 104-mile Ultra Trail Du Mont Blanc come in at over 300 grams. The track spikes Usain Bolt used to set the 100m world record weigh a negligible 140 grams. So remember: lighter shoes are not better shoes, and heavier shoes are not worse shoes. The weight difference can just mean that there are different design priorities. As a runner, you have to decide on your own priorities as well. Do you favor cushioning and comfort (a bit heavier)? Traction and stability (in general, heavier)? A minimalist style (very light)? Shoes with a long life (typically, heavier)? The lightest, fastest shoe possible (light, but a short life)? Your answers to these questions will guide you to the right shoe for your running needs. Is Running Shoe Weight Really Important? A more important question that you really need to ask yourself is why are you running? If your answer is to have a fast pace, better racing performance, and improved race time, then the weight of your shoes might make a big difference. It is important not to sacrifice comfort in pursuit of speed. Reducing the shoe mass by removing cushioning can actually cause you to expend more energy by absorbing shock from each foot strike. On the other hand, if your goal is focused mainly on running for recreation, enjoyment, stress relief, or just to shed a few pounds, then the weight of your running shoes is not really a critical factor. You might want to choose shoes based on style, cushioning, support or stability, or other factors before shelling out for lightweight racers. Always practice “feet first, before you buy.” Know the type of feet you have, as feet come in different sizes and form. The shape and components of the running shoes should match with your foot type for the best fit and more comfortable running experience. There is no “perfect” running shoe, as it entirely depends on the shape of your feet, your bio-mechanics, and your running routine. Try experimenting with different brands and models of running shoes to find the right feel, fit, and functionality. Trust your feet. The best shoe is the one that feels best while you run. Forget about what you see in marketing campaigns, what you hear from your running buddy, or what worked in the past. Instead, get the pair that will make you feel that your shoes are an extension of your body. Knowing the basics of shoe technology and how much running shoes weigh can greatly help in choosing the best pair to suit your needs. For athletes and professional runners, the weight of the shoes greatly matters, as it enhances speed and a handful of seconds can mean the difference between winning and losing. But for those who run for fun, this is not really an important consideration. Remember that the weight of the running shoes is only one factor of many when it comes to the shoe selection process. There are other qualities to look after in a perfect pair of running shoes – design, construction, and comfort are just some of them.